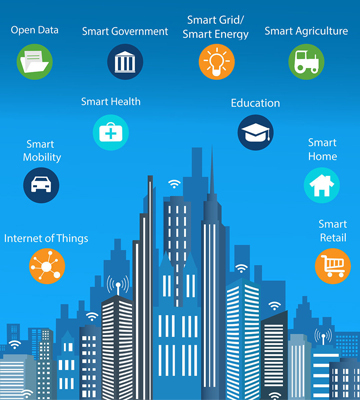 A smart city is an urban area that uses different types of electronic data collection sensors to supply information which is used to manage assets and resources efficiently. There no such thing called thumb rule for smart city, it is basically divided into following categories. Broadly speaking smart cities are designed as per the need of county, society, Climate conditions, Existing infrastructure and need of time. All of our Smart City Project are focused to Quality Of life of citizens by providing Inexpensive energy, Convenient Transit, Emergency Response along with clean Water and Air. Second aspect of Smart city is to provide sustainable Environment with Reduced wastage, Recycling of resources, Efficient transmission, Decrease consumptions. Third import thing is to provide Platform for Good Governance with help of transparent processes, Reduction in Bureaucracy and ease of conducting businesses. We have transformed millions of lives globally through our innovative solutions. Contact us to learn more about our products and services. We are a customer centric ISO 9001:2008, ISO 27001:2005 certified Software Company. We have a team of more than 100 experts and we specialize in ERP Implementation, GPS Tracking, School Automation, cloud computing with highly customizable and scalable solutions. Copyright © 2018. Powered By Lunetta All rights reserved.